If you know me at all, you know my taste in watching people — men or women — is simple: I want them to be real. I enjoy seeing the imperfections, the things that make us unique and different. So, not surprisingly, I’ve been a big supporter of the efforts of promulgating a positive body image for women (and also for men, although the pressure there is perhaps different). For example, I supported the Kickstarter for The Nu Project (FB) [warning: link target is NSFW], a project with the goal of help women appreciate their body, whatever their shape, look, size, age, etc. I constantly read articles noting body image activities, such as the recent Dove campaign or the Buzzfeed editors who took bathing suit photos in Victoria Secret suits (for the record, I thought they look great). My wife has a similar attitude — she’s been large since I’ve known her, although she’s now much less large. However, although we wanted to see it, I just couldn’t fit it into any weekend. That wasn’t the end of the story. My wife said she really wanted to see the show. Given that I normally pick the shows, when my wife specifically wants to see something — I find a way to make it happen. Thus, on a Thursday night we drove into Hollywood to see Amy Halloran (FB) and Medium Size Me. The presentation of this show is very simple: A single person monologue, punctuated by images and the occasional video. What the show says about Hollywood and body image, however, is significant. Amy Halloran had a love of acting, and she didn’t believe that being a chubby girl (who, in reality, wasn’t that chubby) should stop her. It actually didn’t — she acquired an agent easily and started booking lots of parts. The problem was: the type of parts. The fat girlfriend. The fat girl who gets raped. The fat girl who gets raped. The fat girl who gets raped. The fat girlfriend. Often, these parts were in comedies where the fact that she was fat was the target of all the jokes. Hollywood had loads of parts for “the fat girl”. The problem is that the parts often telegraph the body shaming the Hollywood loves to do. The roles that Hollywood gives to the fat girls (less so to the fat guys) just emphasize that to be successful, to be loved, to find happiness, you need to fit Hollywood’s image of beautiful. She also got a Disney Channel movie where she was confronted with a demonstration of how the industry saw her size. She was also lucky at one point to get a series where she was able to project a positive body image. First slated for the fall, it was pushed to the mid-season… and then was cancelled without even being shown. After a number of years of these parts, she decided to change her life. She lost 50 pounds, changed how she lived (and she’s been that size for a number of years — my wife guessed around a size 8). Guess what happened. The jobs dried up. Her agents kept sending her out on jobs for “chubby” or “fat”, but she was too thin to get the jobs. Of course, her agents didn’t send her out for the normal size roles, nor did Hollywood see her as a normal size. In other words, although she had a realistic shape, she didn’t fit Hollywood’s image of “normal”. That’s where she is today. Looking for work. Practicing her craft at Fringe festivals :-). My wife and I both loved this show, and would recommend it to anyone dealing with body issues (alas, last night was the last performance). It did what theatre is supposed to do: provoke a discussion and stimulate thoughts. First and foremost, it demonstrated that although Hollywood professes to be pushing for realistic shapes, that push is coming from just a few actors. In reality, the studios are still run by primarily white men who want a particular shape for women, and they will mold society to get it (no matter how it hurts). Yes, we have the Melissa McCarthy‘s of the world — but look at how her image is really projected. Although the fat jokes may be less, how much of her humor intentionally comes from the fact that she is a very large woman doing those stunts? Even with Mike and Molly, how much of the humor is fat based? Read the comment boards whenever Rosie O’Donnell‘s name comes up. Look at what just happened with the Fat Shamers Subreddit. Now think what is fueling that hatred of the larger woman? The few efforts we have seen are attempting to swim upstream. The problem will not be solved until the media regularly accepts women and men no matter what their shape or size, no matter what their imperfections. It also makes me realize how many men are (to put it bluntly) pigs, sullying the name of my gender. Second, it made me realize what I love live theatre and live performance. As much as the Hollywood Machine emphasizes an unrealistic shape, live theatre (at least to me) seems more realistic. I won’t go as far as to say accepting, but many live productions — especially those in intimate theatre — cast for the talent first and the shape second. Two wonderful examples are recent productions at Repertory East: one of The 25th Annual Putnam County Spelling Bee that cast Rona as a large woman, and the second being their production of 9 to 5 that cast Judy as a large women. Two great performances (from the same actress — Sarah Krieg (FB)) where size made no difference. This is the power of live theatre: it can demonstrate that beauty comes from how you behave, how you perceive your character. [Need another example? Look at the recent production of Violet]. It shows the power of “act as if”. In the end we had a simple show — a sharing of an experience with love, acceptance, and humor. Sharing your story can provide profound insights. 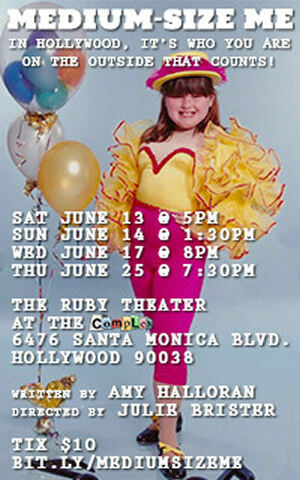 Medium Size Me (FB) was written and performed by Amy Halloran (FB), directed by Julie Brister (FB). The other technical credits were not provided. Last night’s performance at the Ruby Theatre in the Complex Theatres (FB) was the last performance of Medium Size Me. There is always the possibility it will be extended as some of the Best of Fringe shows that extend into July. Upcoming Shows: Our Fringe craziness ends with Might As Well Live: Stories By Dorothy Parker (HFF) at the Complex Theatres (FB) on Saturday. Although there are Fringe shows on Sunday, we won’t be able to see them because we’ll be at the Western Corps Connection (if you don’t know what Drum Corps competitions are, read this) in Riverside on Sunday. July is a month of double-headers, begining with “Murder for Two” at the Geffen Playhouse (FB) on July 3rd, and “Matilda” at the Ahmanson Theatre (FB) on July 4th. The next weekend is another double: On Friday night, July 10th, we’re seeing Colin Mitchell‘s show Madness, Murder Mayhem: Three Classic Grand Guignol Plays Reimagined at Zombie Joes Underground Theatre (FB); Saturday July 11th brings “Jesus Christ Superstar” at REP East (FB). The following weekend is another double header: “The History Boys” at the Stella Adler Theatre (FB) on Saturday (Goldstar), and “Green Grow The Lilacs” at Theatricum Botanicum (FB) on Sunday. The last weekend of July brings our last double: “Lombardi” at the Lonny Chapman Group Rep (FB) on July 25th, with the annual Operaworks show the next day. August start calming down, with “As You Like It” at Theatricum Botanicum (FB) the first weekend of August, our summer Mus-ique show the second weekend of August, and “The Fabulous Lipitones” at The Colony Theatre (FB) the third weekend of August. After that we’ll need a vacation … but then again we might squeeze in Evita at the Maui Cultural Center (FB) the last weekend of August. September right now is mostly open, with the only ticketed show being “The Diviners” at REP East (FB) and a hold-the-date for “First Date” at The La Mirada Theatre for the Performing Arts (FB). October will bring another Fringe Festival: the NoHo Fringe Festival (FB). October also has the following as ticketed or hold-the-dates: Kelrik Production (FB)’s Urinetown at the Monroe Forum Theatre (Hold for Sat 10/3); “Mrs. A. Lincoln” at The Colony Theatre (FB) (Ticketed for Sat 10/10); and “Damn Yankees” at Cabrillo Music Theatre (FB) (Ticketed for Sat 10/17). As always, I’m keeping my eyes open for interesting productions mentioned on sites such as Bitter-Lemons, and Musicals in LA, as well as productions I see on Goldstar, LA Stage Tix, Plays411.